Informal literacy experiences often serve to shape young people's identity as readers and writers as much as or more than formal schooling.Community and family support can emphasize the importance of reading and writing, build confidence, influence young people's literacy habits, and encourage youth to seek out ways to engage in literate activities. Through a renewed national push for literacy on all levels, both families and community members have diverse opportunities in which to impact students' literacy skills.This article offers strategies to develop community engagement. Literacy begins at home. All families engage in literacy on a daily basis through conversations, sharing ideas, reading, and writing. These practices set the framework for a child's literacy and overall academic performance. A study of 300 early elementary school children from high-poverty families in Baltimore finds family encouragement of summer school attendance is one of the best predictors of program impact (Borman & Dowling, 2006). A Learning Point Associates (2005) report finds that adolescents who are supported by their families to engage in literacy programs and/or read books independently are more likely to increase their grades in the fall than students who do not receive such support. In fact, students from lower income backgrounds who are exposed to strong family literacy engagement outperform their more advantaged counterparts who did not have strong parental interaction. To encourage family engagement, a Northwest Regional Education Laboratory article It's All in the Family suggests creating informal and formal practices between parents and children (Douglas, Henry, & Martin, 2003). On an informal level, families can engage their adolescents through subject-specific conversations, visiting the local library, and storytelling. On a formal level, families can set aside time for reading, homework assistance, and volunteering in the child's classroom. And, as the research indicates, families should motivate adolescents to engage in out-of-school time activities and regularly attend summer and afterschool programs of interest for both enrichment and academic purposes. Communities have resources that can significantly supplement summer and afterschool programsand the experiences they offer to participants. Libraries, museums, cultural centers, guest speakers, universities, and businesses can all make unique contributions to summer and afterschool programs, and can encourage youth to engage in a variety of literate activities. Community support is also invaluable in helping to sustain the program and drawing in needed tutors and volunteers. One example of an interesting community engagement strategy is the Verizon Literacy Campus that serves over 3,000 students in 200 classes across 40 different locations. More than 200 volunteers serve as tutors in high-poverty areas. These dedicated workers partner with minority and migrant families to improve family literacy at home and provide structured programs for adolescents during out-of-school time. Another example is the University of Kansas Center for Research on Learning that provides coaching and professional development opportunities for community volunteers interested in working with adolescents. The Center's Strategic Instruction Model (SIM) provides a comprehensive approach to adolescent literacy and gives community coaches tools to work with students on reading and writing skills. Although the Center no longer offers tutoring services, its instructional and strategic coaches help students with learning techniques, classroom tasks, homework, and summer reading. The focus of the program is to provide parental forums for discussion, adult education and professional development opportunities, and activities parents can use to encourage early and adolescent literacy at home. 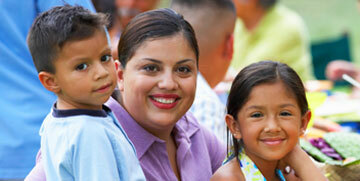 The program serves over 30,000 families. The focus of the program is to provide educational and economic opportunities for parents at the lowest end of the literacy continuum. Increasingly, federal and state policies require parents and families to take responsibility for seeking out and enrolling their children in supplemental or out-of-school time services that complement their school experiences. Thus, it is essential that families and communities work together with schools and providers to understand and communicate student needs, identify and make known available resources and programs, identify common challenges, and explore areas for further collaboration. Traditionally, family and community engagement has focused on school-day activities and curricular requirements. As more opportunities open to students outside of the school day, families and communities will need to become more informed and savvy in selecting the opportunity that is right for their particular young person. Create mechanisms to widely share information about available summer and afterschool opportunities within communities. Develop a resource guide for families that helps them select the program and activities most appropriate for their young person's needs and interests. Design and implement community awareness campaigns to underscore the importance of literacy and developing literate habits. Provide opportunities for parents to participate in their child's summer and afterschool programs, and to learn from the expertise of trained staff. Borman, G.D., Benson, J., Overman, L.T. (n.d.). Family, schools, and summer learning. Madison, WI: University of Wisconsin, Madison. Britsch, B., Martin, N., Stuczynski, A., Tomala, B., & Tucci, P. (2006). Literacy in afterschool programs: Literature review. Austin, TX: Northwest Regional Educational Laboratory, National Partnership for Quality Afterschool Learning, and Southwest Educational Development Laboratory. Douglas, R., Henry, N., & Martin, N. (2003, Summer) It's all in the family: Planning high- quality family literacy events. The Tutor. Portland, OR: Northwest Regional Educational Laboratory. Learning Point Associates. (2005). Ten years of research on adolescent literacy, 1994-2004: A review. Naperville, IL: Author. McGill-Franzen, A. & Allington, R. (2001, August). Lost summers: For some children, fewbooks and few opportunities to read. Classroom Leadership. Baltimore, MD: Center forSummer Learning, Johns Hopkins University. Excerpted with permission from Center for Summer Learning. (2007). Motivating Adolescent Readers: The Role of Summer and Afterschool Programs, pp. 22-24. Baltimore, MD: Author.